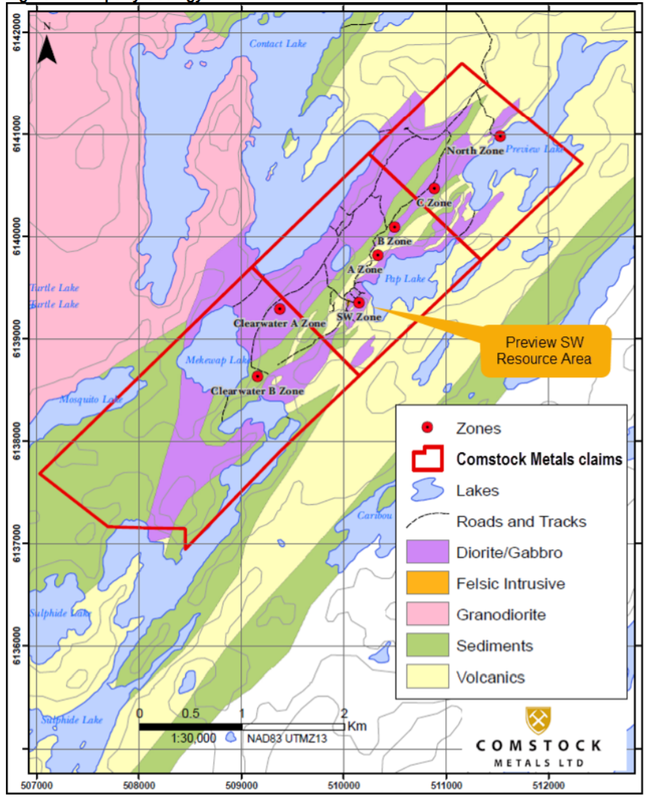 Vancouver, BC / TheNewswire / January 31, 2019 - Comstock Metals Ltd. (TSX-V: CSL) ("Comstock" or the "Company") is pleased to report the results from the winter diamond drilling program at its 100% owned Preview SW gold project, located 40 km northeast of La Ronge, Saskatchewan. These results are from 5 NQ diameter drill holes, totalling 810 metres, completed at the Preview North zone ("Preview North"). "We are very pleased with the results from our winter drilling program at Preview North. The discovery of multiple occurrences of visible gold in 4 of the 5 holes drilled with corresponding high-grade intercepts continues to validate the Company's Preview North zone exploration strategy", commented Comstock's Interim CEO Steven H. Goldman. The Preview North zone is located approximately 2.6 km northeast of the Preview SW deposit which hosts Indicated resources containing 158,300 ounces of gold (2.61 million tonnes grading 1.89 g/t Au) and Inferred resources containing 270,800 ounces of gold (5.70 million tonnes grading 1.48 g/t Au)1, both based on a 0.50 g/t Au cut-off grade (see Comstock's news release dated September 14, 2016). The 2018 Preview SW winter diamond drilling program comprised 5 NQ diameter holes, totalling 810 metres, at the Preview North zone. 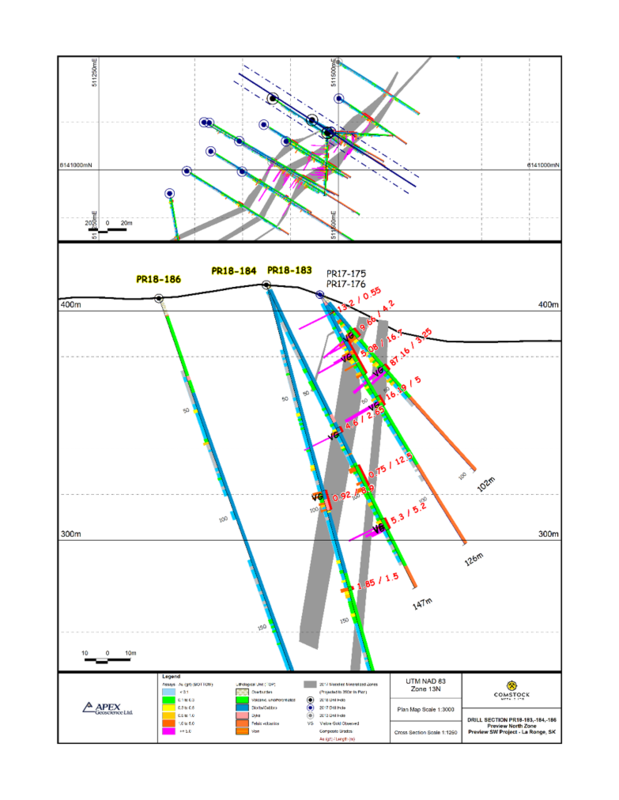 The program was designed to test the interpreted down-plunge and down-dip continuity of gold mineralization identified during the 2017 winter and summer drilling programs (see Comstock news release dated September 28, 2017), and from 2013 drill hole PR13-183 (17.98 g/t Au over 5.71 m starting at 10 m below surface, 5.96 g/t Au over 5.66 m starting at 19 m below surface and, 1.88 g/t Au over 21.26 m starting at 29 m below surface). Visible gold was identified in four of the five holes drilled during the 2018 program, associated with sheared quartz-carbonate vein zones containing variable sulphide mineralization (arsenopyrite, pyrite +/-pyrrhotite). 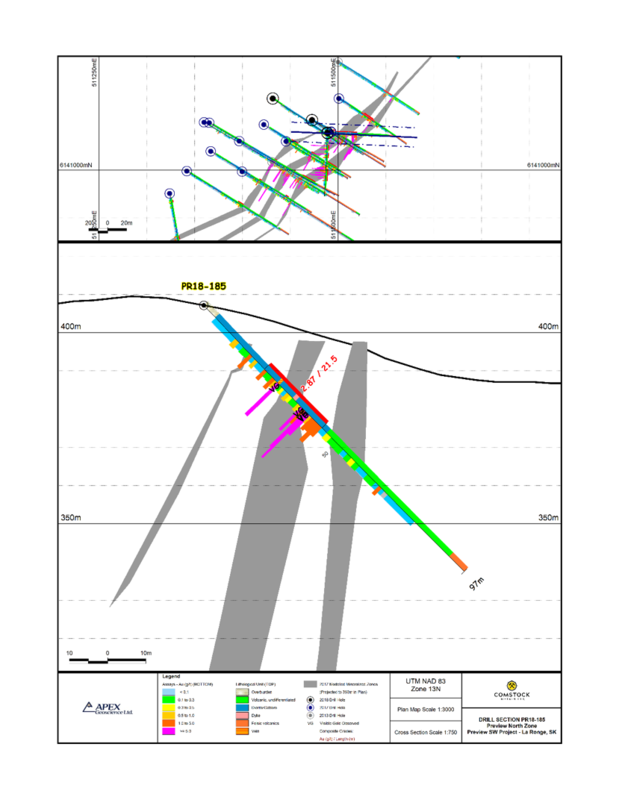 Results from the 2018 program correlate well with previous results, and with the Preview North zone 3D mineralization model. 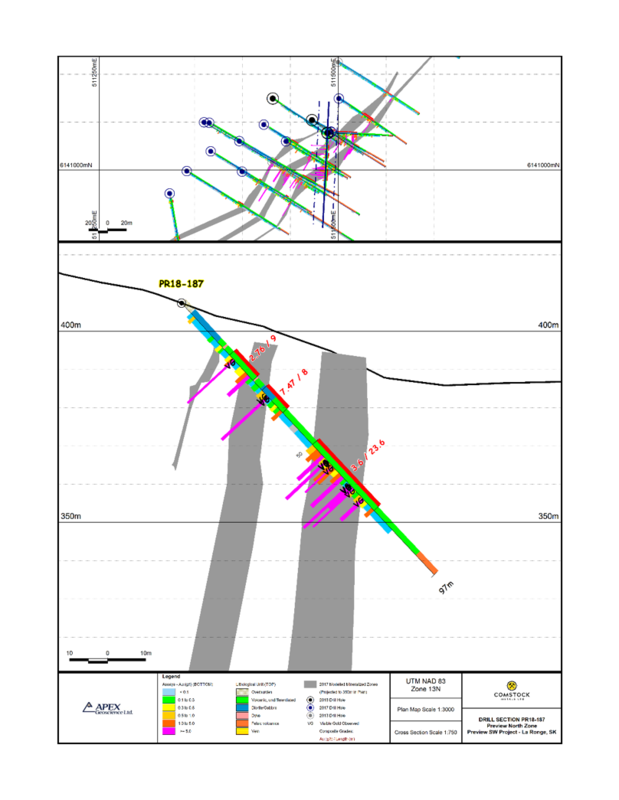 Previous drilling has defined three principal parallel structures/vein zones along which the main mineralized intercepts occur, extending 350 metres along strike and up to a depth of 140 metres below surface. Higher grades intersected occur within a core zone over a strike length of approximately 170 metres. 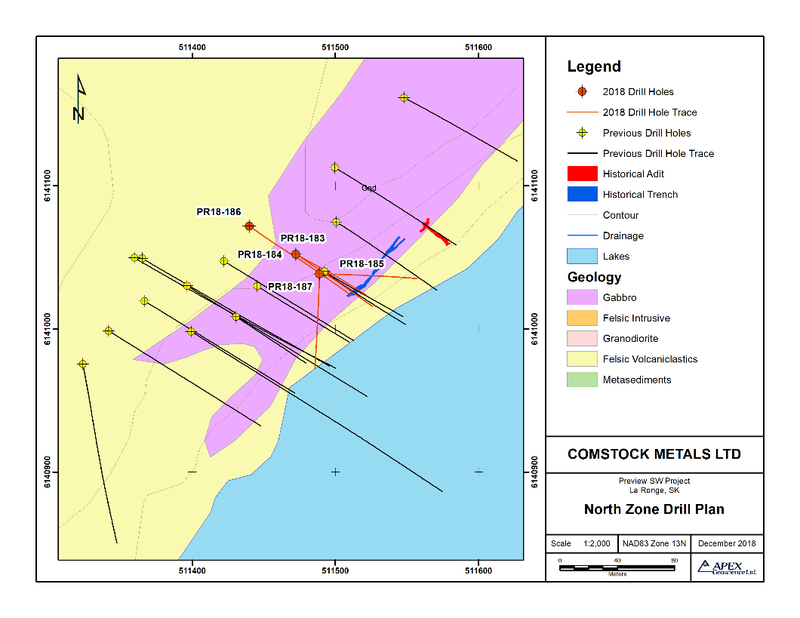 The 2018 drilling program succeeded in identifying additional high-grade gold mineralization down-dip and along strike of previous drill holes, and enhances the understanding of the geometry of mineralization at Preview North. The current structural interpretation suggests the presence of steeply plunging high-grade gold zones at Preview North, however further work and interpretation is required to resolve the continuity of individual gold intercepts between holes. The Company has integrated the new results from the Preview North zone into its project database along with geological data collected, and will incorporate the new information into the 3D model for Preview North to direct future exploration. Significant weighted average intercepts are presented in Table 1. Hole locations are shown on Map 1 and Section 1, Section 2 and Section 3. * Intervals listed are for core length. True thickness is interpreted to be 50-60% for PR18-183 and PR18-184; and 70-80% of core length for holes PR18-185 and PR18-187. The analytical work reported on herein was performed by ALS Canada Ltd., an internationally recognized analytical services provider. The Company follows industry standard procedures for the work carried out on the Preview SW project, with a quality assurance/quality control (QA/QC) program. Blank, duplicate and standard samples were inserted into the sample sequence sent to the laboratory for analysis. Comstock detected no significant QA/QC issues during review of the data. Kristopher Raffle P.Geo., Principal and Consultant of APEX Geoscience Ltd., and Christopher Livingstone, P.Geo., Project Geologist of APEX Geoscience Ltd., Qualified Persons as defined by National Instrument 43-101, supervised the exploration work and diamond drilling program at the Preview SW project and reviewed, verified (including sampling, analytical and test data) and compiled the data reported herein. Mr. Raffle has reviewed and approved the scientific and technical disclosure in this news release as it relates to the Preview SW Gold Project. Comstock Metals Ltd. is an exploration company with several resource projects located in North America. Presently evaluating opportunities in the battery metal space Comstock recently secured the Rawhide Cobalt-Silver Project in Ontario adding to its two gold projects: Preview SW Project in Saskatchewan and the QV Project located in the White Gold district of the Yukon. Comstock recently announced the sale of its QV Project to White Gold Corp. (TSX.V: WGO). (See Comstock's press release dated January 14, 2019). Comstock also has a joint venture agreement and equity investment with E3 Metals Ltd. (TSX.V: ETMC) a Petro-Lithium company located in Alberta Canada. For more information about E3 Metals, please visit their website: www.e3metalscorp.com. This news release includes forward-looking information and statements, which may include, but are not limited to, information and statements regarding or inferring the future business, operations, financial performance, prospects, and other plans, intentions, expectations, estimates, and beliefs of the Company. Such statements include statements regarding the drilling program on the Preview SW Gold Project. Forward-looking information and statements involve and are subject to assumptions and known and unknown risks, uncertainties, and other factors which may cause actual events, results, performance, or achievements of the Company to be materially different from future events, results, performance, and achievements expressed or implied by forward-looking information and statements herein. Although the Company believes that any forward-looking information and statements herein are reasonable, in light of the use of assumptions and the significant risks and uncertainties inherent in such information and statements, there can be no assurance that any such forward-looking information and statements will prove to be accurate, and accordingly readers are advised to rely on their own evaluation of such risks and uncertainties and should not place undue reliance upon such forward-looking information and statements. Any forward-looking information and statements herein are made as of the date hereof, and except as required by applicable laws, the Company assumes no obligation and disclaims any intention to update or revise any forward-looking information and statements herein or to update the reasons that actual events or results could or do differ from those projected in any forward looking information and statements herein, whether as a result of new information, future events or results, or otherwise, except as required by applicable laws.